With Android 9 Pie now rolled out to the Pixel family, WhatsApp has started testing support for MessagingStyle inline images for the notification panel. WhatsApp used to show inline images in notifications earlier as well, but it looks to now support the new MessagingStyle notification format for expandable and collapsible inline images in the future. WhatsApp is currently testing the feature in the beta channel, and another notable addition spotted in Android beta is the availability of a new sticker pack called Biscuit. Starting with the new design for inline messages in notifications, Android Police spotted this change in Android beta v2.18.291. 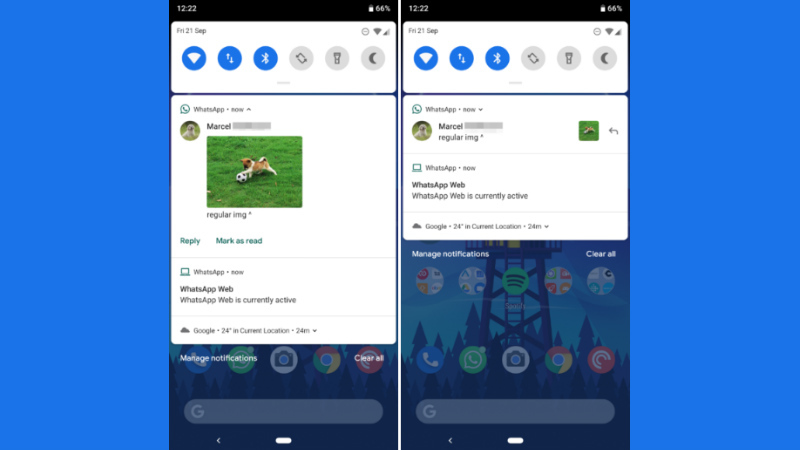 This feature will only work on a device running Android 9 Pie, and it will allow the WhatsApp image notification to expand and collapse to show the picture's preview. The rest of text messages will show up as they used to above and below the image preview. This doesn't work for GIFs and videos, and they still show up in a small icon notifying the user that they've received it, but those won't be collapsible or expandable for preview. When an image is shared in a WhatsApp group, the photo still expands for preview, but when collapsed it shifts to the right, with the group icon sitting next to it. The report states explicitly that this feature works only with Android Pie, and therefore all phones running on old Android versions or even Oreo won't be able to see it in beta or after the stable release as well. Separately, WABetaInfo reports that a new sticker pack called Biscuit has been added to WhatsApp, though the Stickers feature itself is not yet available to users - it is disabled by default. Biscuit has been a popular sticker pack in Messenger for a while now, and it now looks to make its way to WhatsApp as well.